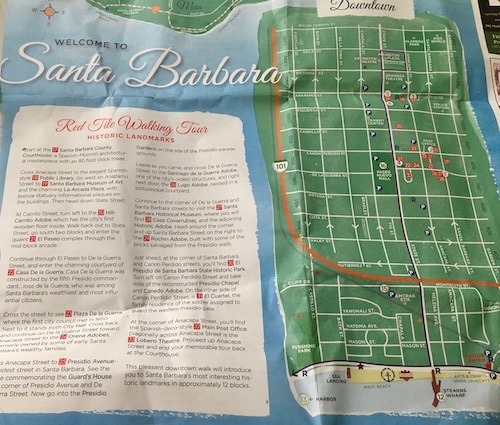 Downtown Santa Barbara isn’t big, but has pretty streets populated by historic buildings, parks, fun shops, and restaurants. One can put together a really nice run downtown, as either standalone or in combination with the nearby waterfront. 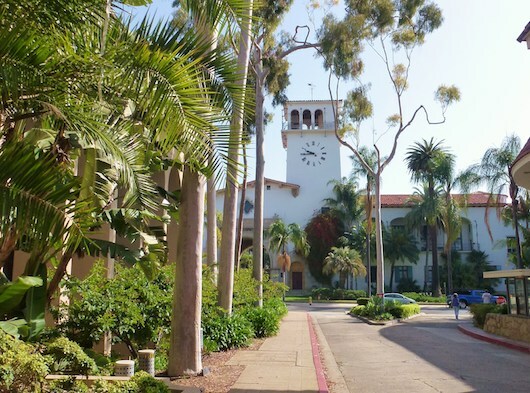 Rather than a specific route, we recommend using State St. as an anchor, and at the eastern end, the Santa Barbara Mission. It’s 2.5 miles one-way from the Mission to the waterfront, using Garden St. to run by Alice Keck Park Gardens and Park. There are several interesting buildings and landmarks just off State St. to the north– see the attached map for the ‘red-tiled walking tour’. Enjoy some of the tree-lined side streets as well off State St. as well. For flatter running, use the north-south side streets, as it’s pretty much uphill from the waterfront heading out of town.